I'm still waiting for the promised thundersnow I heard the DJ talking about on the radio yesterday morning, but so far there's been no sign of it - although it was very stormy last night, which made very glad to be indoors. Richard pointed out a day or two ago, that this time last year we were camped out in a drafty shed in York, mad, mad, people that we are! With no camping this weekend, I headed off to the spinning guild yesterday for the second time ever. Coventry's guild meet every third Saturday of the month and I'm still having difficulties in adjusting to the fact we're in January, while at the same time Christmas seems six months ago, so would have missed the fact the guild was meeting at all, if Claire hadn't reminded me. This is one of Violet Green's superwash merino's in a pastel sort of mix, which appears predominately pink in the roving form, but here it looks more minty blue. I've got used to the shorter staple length and I'm working it quite well, especially since I'm able to spin without using the park and draft method now. I'm still horribly slow and the single you can see in these photographs represents between three and four hours worth of spinning. 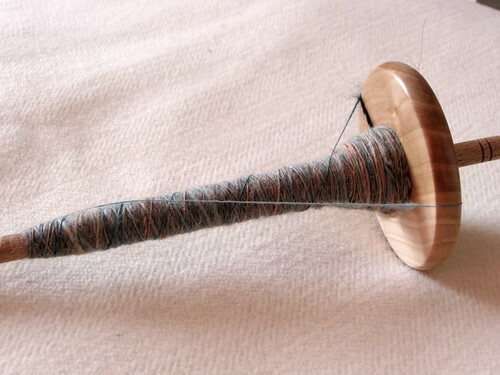 I tend to only spin for short periods on the spindle, certainly working for no longer than 30 minutes at a time, so spending well over an hour spinning yesterday was a rare treat. My spinning is coming along though and I can see definite improvement in the consistency of the single I'm producing and my technique seems to be working for me, so I think I shall persevere. 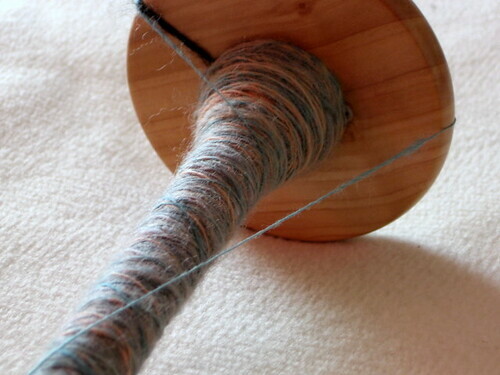 One thing that struck me while watching the other ladies, was how easy and relaxed they make spinning at a wheel look. One day, maybe I'll manage that kind of serenity, but for now the spindle is far more soothing than the wheel as for the most part, I can control what it does rather than having the distinct impression that it's got a mind of its own! Christmas does seem a very long time ago.